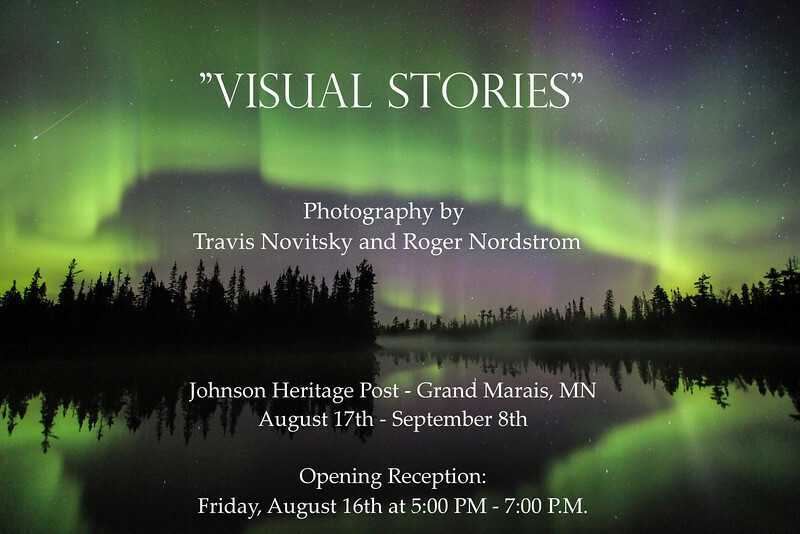 Join Travis Novitsky and Roger Nordstrom as they share their images in a photography show at the Johnson Heritage Post in Grand Marais, MN from August 17th to September 8th, 2013. 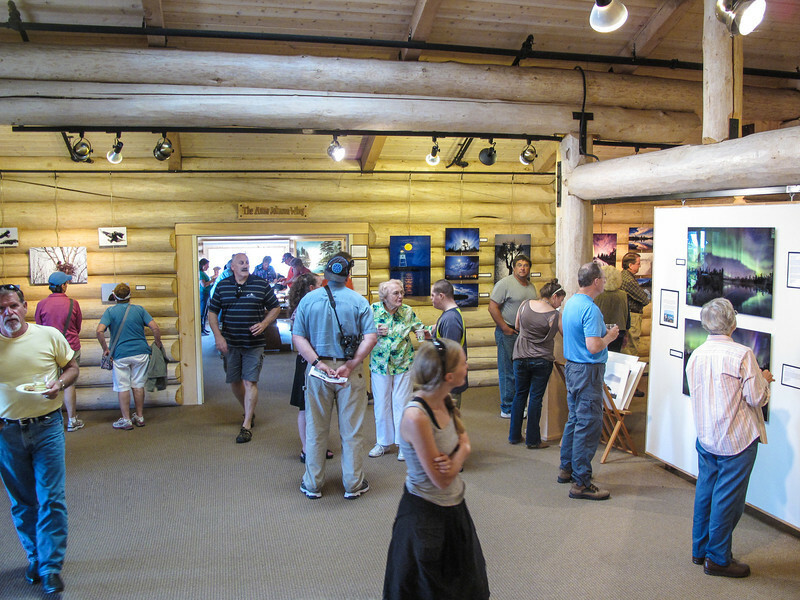 The gallery is open Wednesdays through Sundays from 10:00 AM to 4:00 PM. 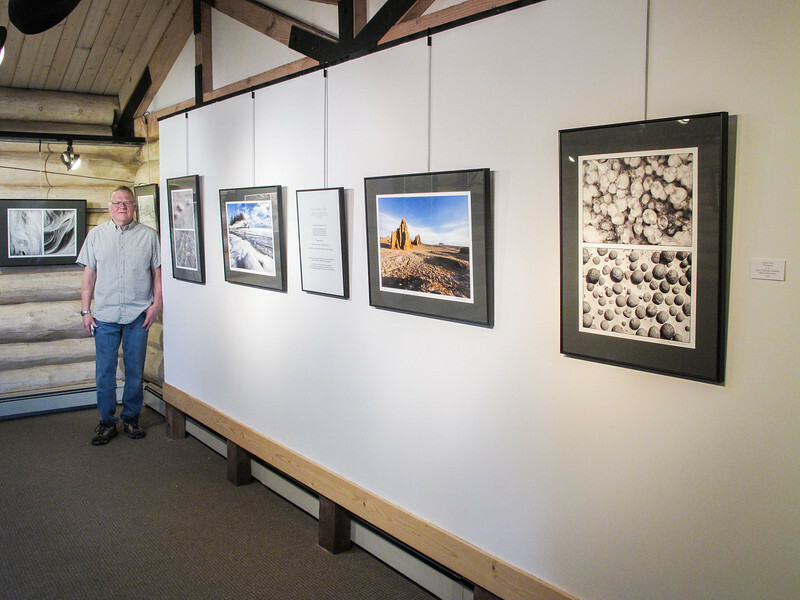 I am going to have close to 50 of my images on display. 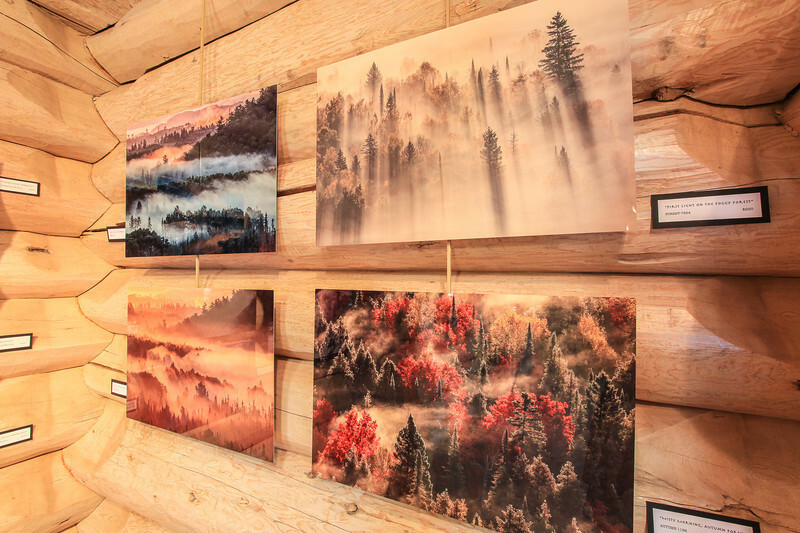 This will be a GREAT opportunity to see and (if so desired) purchase some of my work! 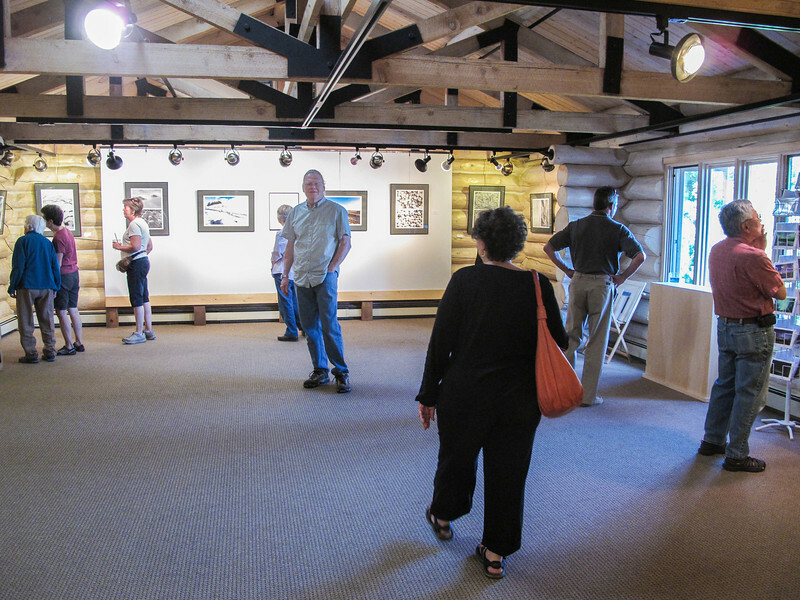 There will be an opening reception on the evening of Friday, August 16th from 5:00 PM to 7:00 PM. We hope to see you there! 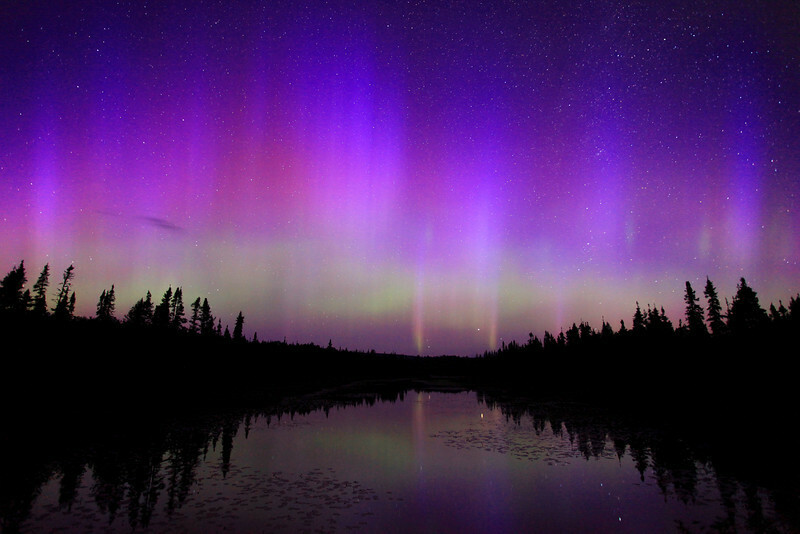 There were AWESOME northern lights last night! 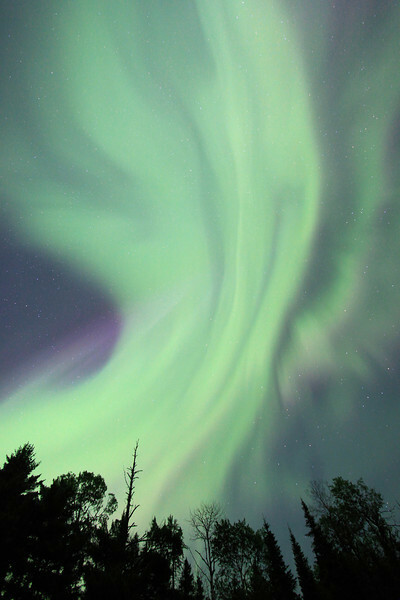 It was an unexpected occurrence as Earth passed through a region of south-pointing magnetism in the solar wind. 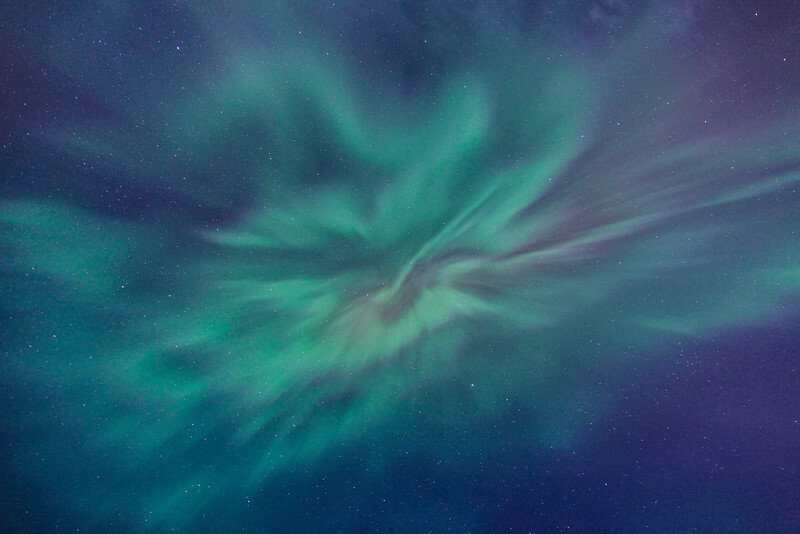 I didn't know there was even a chance of northern lights until I looked at the Aurora Soft Serve News website late in the afternoon and saw that the aurora was "Active". I kept checking the site throughout the evening and the Kp index (a scale which measures the intensity of the aurora) kept creeping up until eventually it was at "Storm" level! We had quite a few clouds at sunset but not long after the sun went down the sky cleared and stayed that way the entire night. I left the house at 11:00 PM to photograph the lights and returned home about 4:00 AM. I decided to try shooting over Devilfish Lake in Grand Portage State Forest, since the lake has a terrific northerly view from the public boat landing. 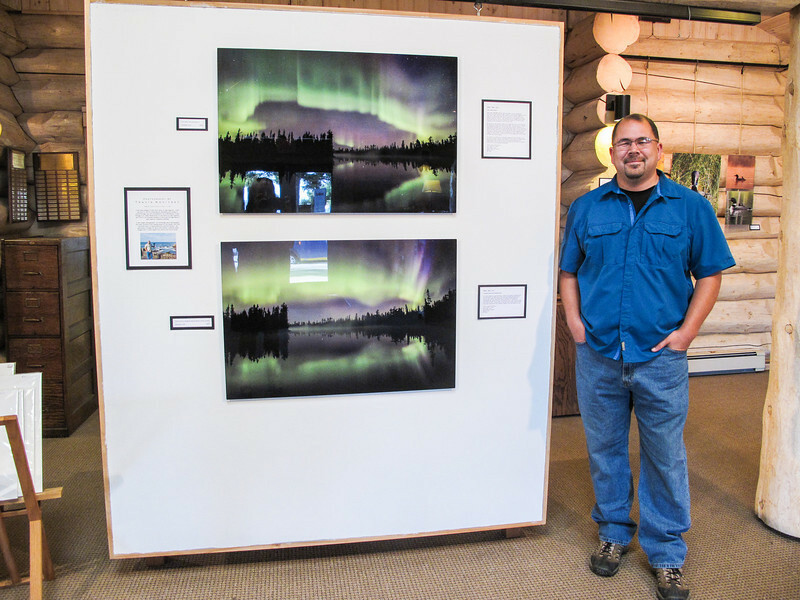 When I arrived at the lake there was a full-blown aurora storm waving and dancing throughout the sky! I scrambled to get my gear set up and as quickly as I could I started making images. For the next hour I stood in awe as the sky erupted with waves of light and color over and over again. This photo is my favorite out of the 300+ images that I shot last night. I was even lucky enough to capture a shooting star in the top left of the photo! 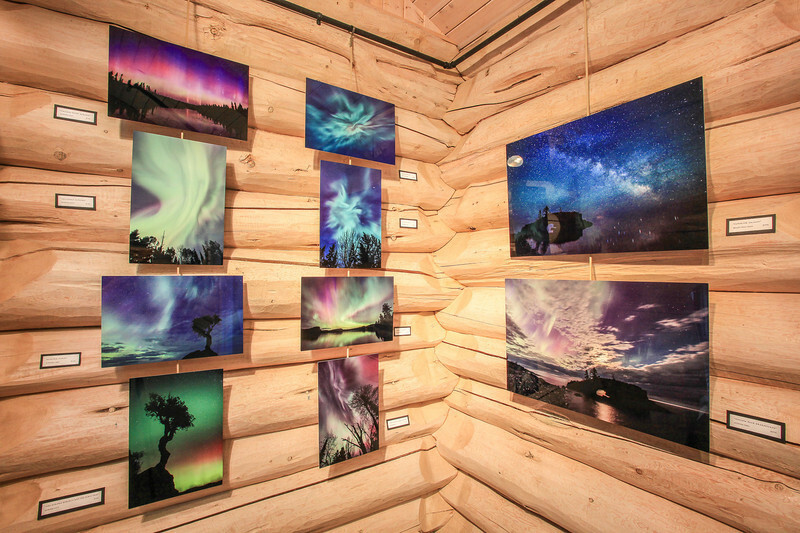 The feeling that you get as these waves of aurora wash through the sky is indescribable. Let's just say you feel very humbled and fortunate to be able to witness such an awe-inspiring phenomenon! 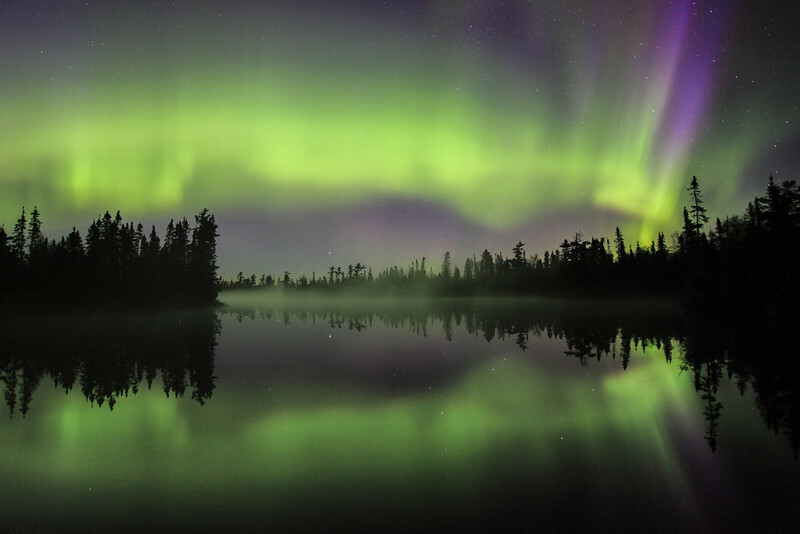 "Celestial Storm over Devil Fish Lake"
I could not believe my eyes last night as I stood on the shores of Devilfish Lake and watched this incredible aurora filling the sky overhead and reflecting in the ultra-calm waters of the lake below. This photo was taken about ten minutes after the "Solar Shock Wave" photo was made. As I watched this unbelievable light display in the sky, the haunting call of a pair of loons echoed from across the lake. 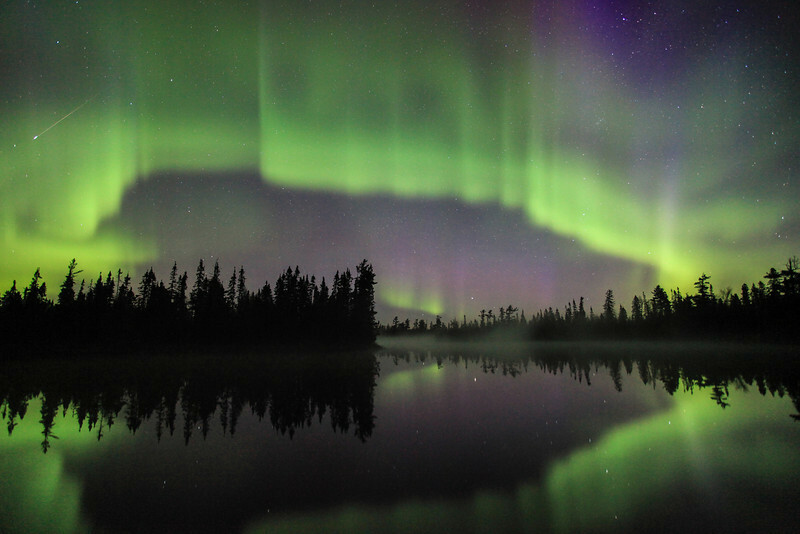 I couldn't think of any music more perfect than the call of loons while watching the Aurora Borealis. Heaven in the north woods for sure! "The meeting of Earth and Sky"
Last night before going to bed, I looked at the spaceweather.com website just in case there were any reports of aurora activity. 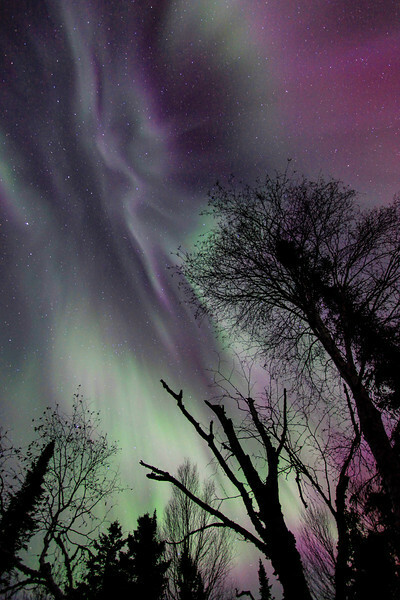 As luck would have it, an interplanetary shock wave had just arrived and was sparking aurora activity. 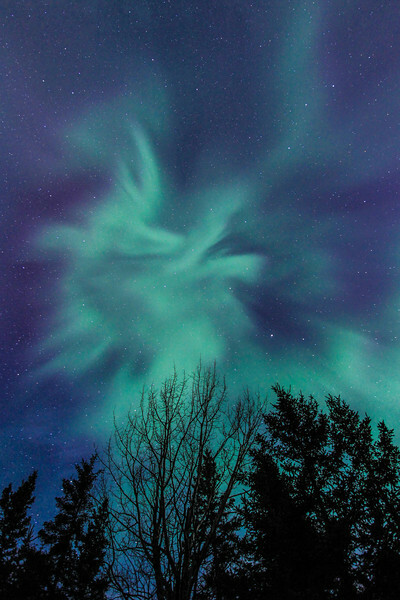 The source of the shock wave was unknown, but researchers say it could have originated in a transition zone between high and low speed solar wind streams. 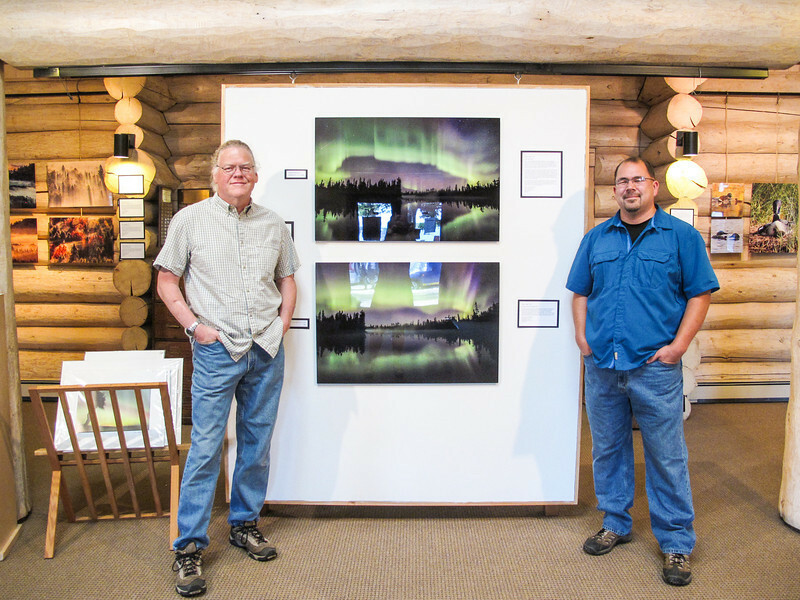 The shock wave ended up generating nearly 15 hours of geomagnetic storming. I left the house at 11:30 PM and spent the next 4 hours searching for openings in the clouds so I could photograph the lights. It looked like the sky might be clearing to the northwest so I decided to head in that direction. I drove up the Arrowhead Trail and found a nice shooting location near Irish Creek. 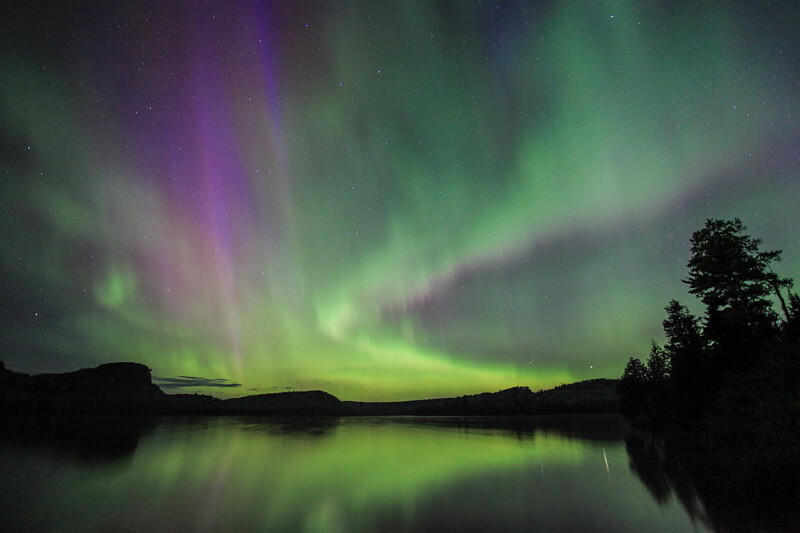 The clouds were breaking up just enough to let the aurora shine through, and it was magnificent! Light fog along the ground added an extra bit of mystery to the scene and all around me the spring peeper frogs were singing as the lights danced overhead. I also heard a couple of barred owls talking to each other in the distance! I continued driving up the trail until I arrived at McFarland Lake. 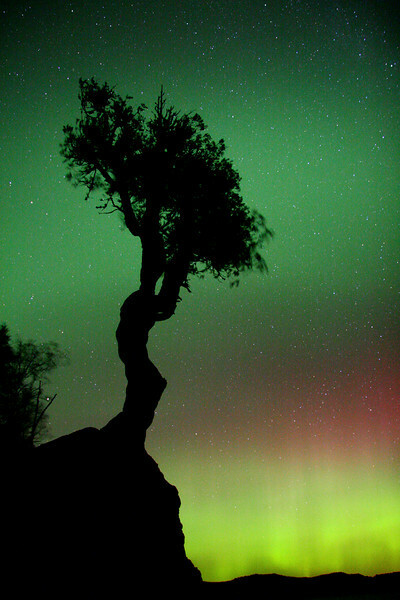 In my opinion, McFarland is one of the best places in Cook County to watch the northern lights. 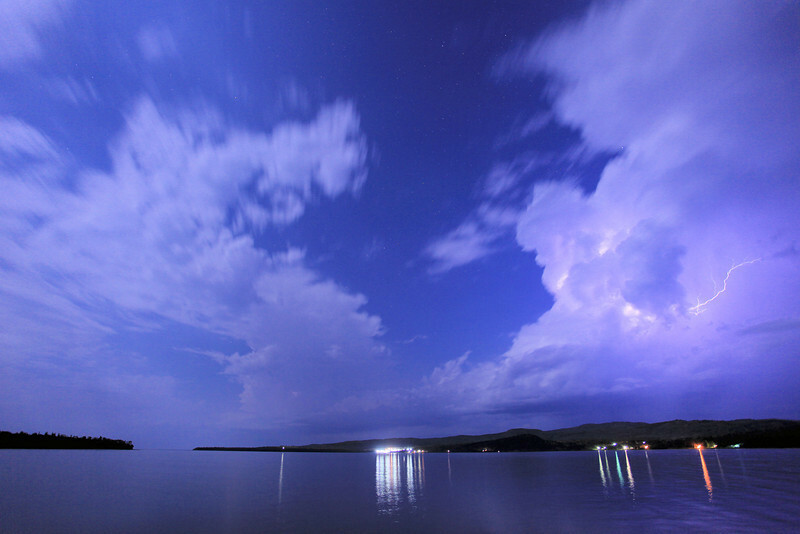 Unfortunately when I arrived at the lake the sky was still completely covered with clouds. I hung around here for almost two hours hoping the sky would clear, but it never did. Several times, however, the cloud cover got thin enough that the glow from the lights could be seen through the clouds. As I drove back down the Arrowhead Trail the sky was completely socked in with clouds and thick fog covered the ground. When I got back to Highway 61, however, the fog had lifted and there were some openings in the clouds. 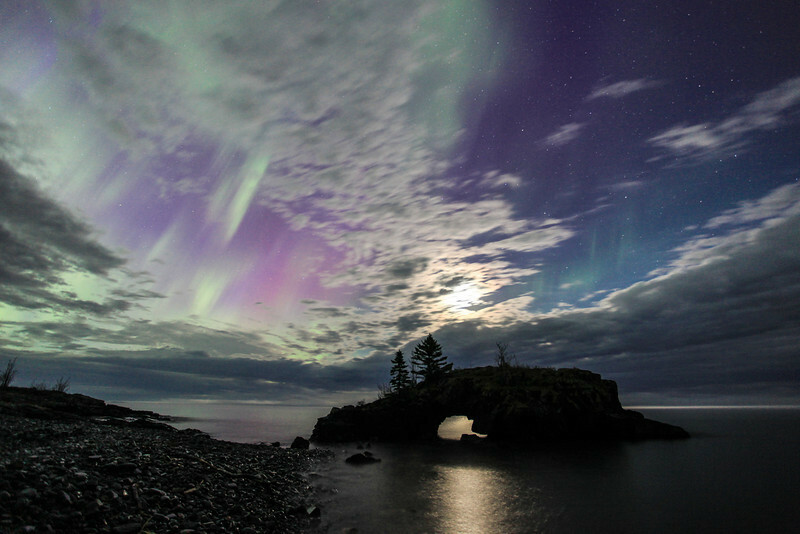 By the time I was driving by Hollow Rock Resort on the Lake Superior shoreline the clouds were receding quickly and the sky was full of dancing northern lights. Of course I had to stop at Hollow Rock once I saw these conditions! 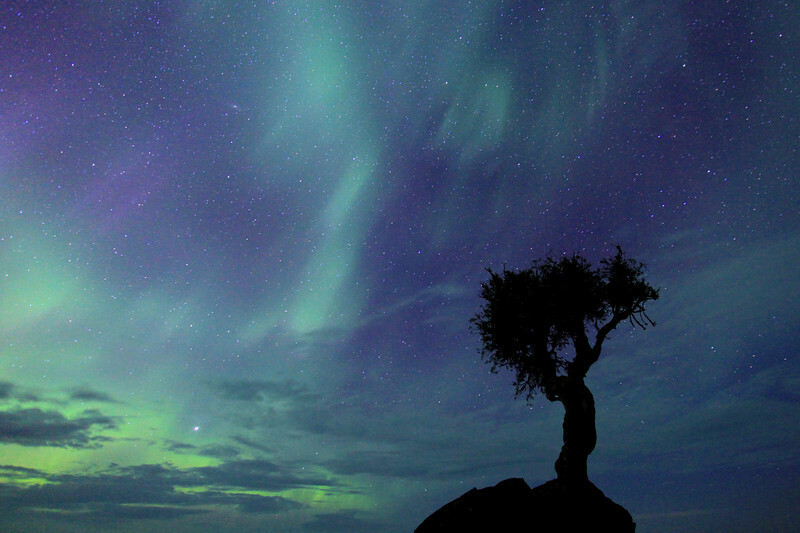 Since the view here is more east/southeast than north, opportunities to see the aurora over the rock are rare. This photo was made about 3:30 in the morning and was the last shot I made before heading home and crawling into bed. It sure was a fantastic night! Last night Jessica and I got outside to enjoy the supremely calm conditions that were prevalent across northeast Minnesota. The stillness of the night was unbelievable. 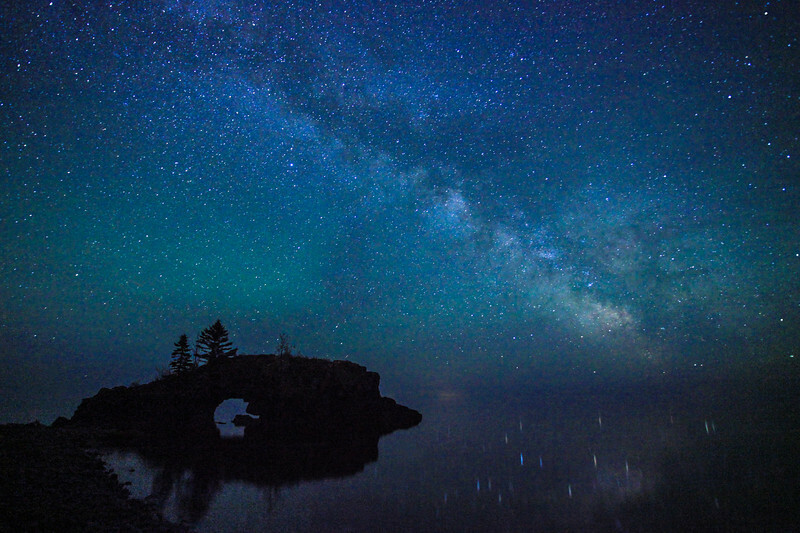 Rarely have I seen Lake Superior so calm and never before have I seen the stars reflecting so nicely in the waters of the big lake. We were treated to incredible views of the Milky Way Galaxy, which was our focus for the evening but we were also (as always) hoping to see some northern lights that were possible overnight. 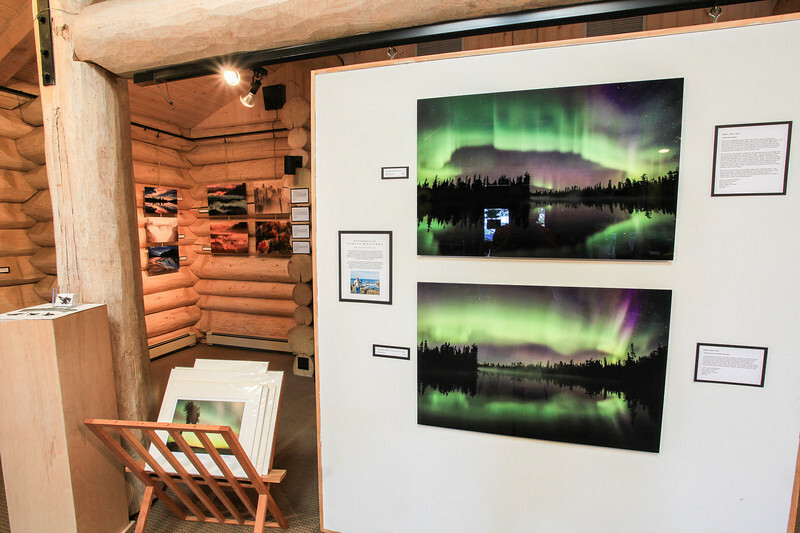 The aurora never happened but the extreme calm of the night air combined with stars that were literally jumping out of the sky at us made for an unforgettable experience. Tonight is a stark contrast to last night as we are experiencing some rainfall and wind. Every day is different, and I love it! The sight you see here is a vivid memory that will live forever in our minds. I owe thanks to Jessica for this photo, for it was at her urging that we went out to photograph the Milky Way on this most exquisite of nights! 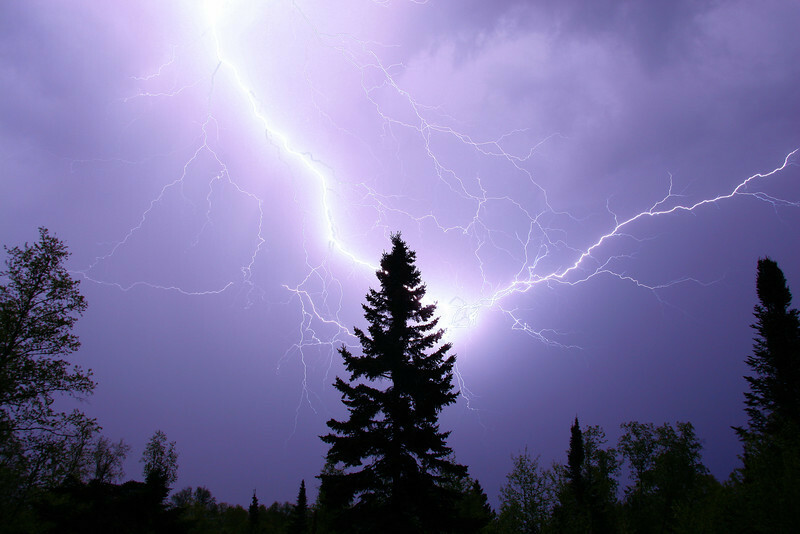 This evening an incredible series of thunderstorms rolled across Grand Portage Bay between 9:00 PM and 1:00 AM. It was some of the most intense lightning I've ever seen in this area. 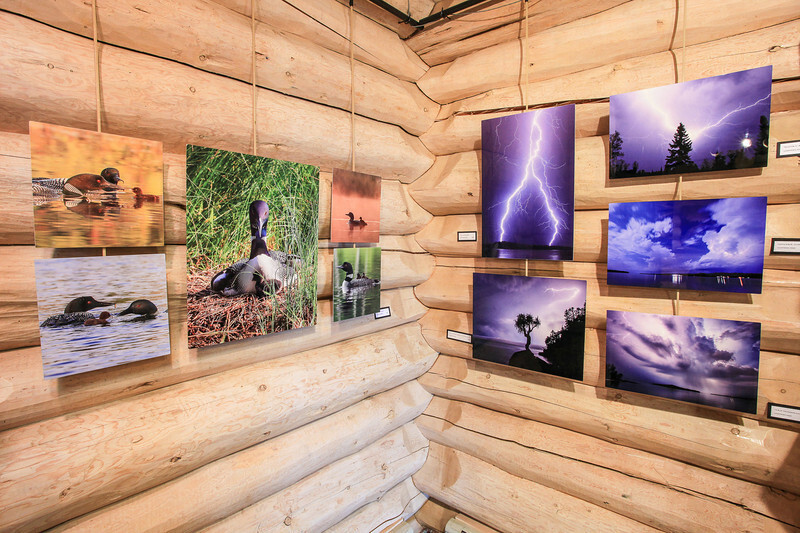 I photographed the lightning for almost 3 hours from my boat shed on the Lake Superior shoreline. I got really lucky on this image, as the lightning flashed almost immediately after I hit the button on the remote shutter release, and it was a very bright flash so I hit the button again immediately after the flash. It ended up being only a one second exposure! 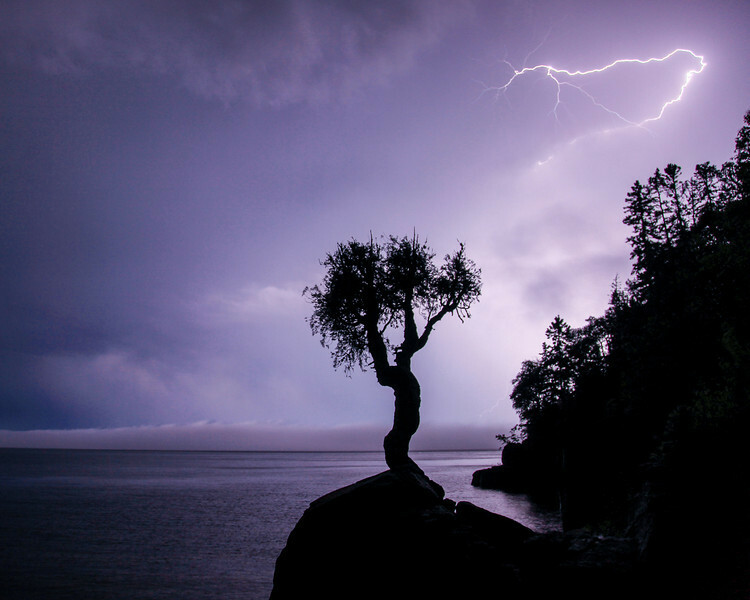 "Midsummer Storm at the Spirit Tree"
Yesterday throughout the day and all through last night we experienced one incredible thunderstorm after another. Some particulars from the weather warnings throughout the day: 70 MPH winds, possible golf-ball size hail, heavy rainfall and flood advisories. To top it off the power was out for most of the night as well. We ended up with anywhere from 2 to 4 inches of rain, depending on where the measurement was taken. The Pigeon River in Grand Portage State Park went from a discharge rate of roughly 4,000 gallons per second yesterday morning to about 28,000 gallons per second today. The storms also produced the best lightning show that we've seen so far this year. As day turned to night I couldn't resist the light show that was going on throughout the sky. I ended up spending about two and a half hours standing on the Lake Superior shoreline trying to capture photos of the lightning. I went down to the Spirit Tree, which is not far from my home. I've always wanted to capture a "knock your socks off" photo of lightning behind the tree (similar to a shot that my dad captured on slide film years ago), but the photo I dream of still eludes me. I am getting closer, however. Last night's storms yielded my best results yet at photographing lightning behind the tree. The photo you see here is the result of two hours of standing in the rain trying to capture the perfect bolt of lightning while thunder rumbled all around me. It was definitely one of the most uncomfortable periods of time I've ever spent outside with my camera, but an effort that I consider worthwhile when I view this image. This was a lightning storm that hit in the middle of the night and woke me from a deep sleep. I actually shot this photo from my open bedroom window. The storm and the lightning were VERY close, so I didn’t want to risk going outside. As it turns out, the best lightning was occurring directly over my driveway, which was perfectly visible from my upper-level bedroom window. I opened the window, popped the screen out and set up my tripod. For the next half-hour I had an absolute blast capturing photos of the lightning! 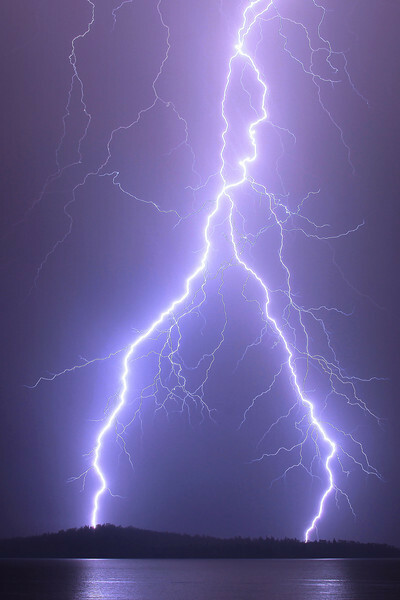 Last night the sight of lightning flashes outside the bedroom window woke me at 1:30 AM. I laid in bed for a while watching the lightning as it flashed over the summit of Mt. Josephine. After several minutes I decided I couldn't pass up this opportunity and headed outside to make some photographs. When I got out in the yard I looked up and saw a HUGE cloud with a very defined edge starting on the western horizon and jutting straight up into the sky. On the right side of this edge was a massive storm cloud with lightning flashing inside it every few seconds. On the left side of this edge was clear blue sky with several stars visible. I decided to head over to Hat Point Marina and photograph the storm from the ferry dock. For the next 45 minutes I watched as the lightning flashed up in the clouds. Other than the lightning and the occasional rumble of thunder, the night was incredibly calm. No wind whatsoever, and only a few light drops of rain fell from the clouds. Storms like this don't happen very often so when they do it sure is nice to be able to sit and watch them like I did last night. Ah, the joys of spring! Even if it is a bit early, I do love the signs of spring. Perhaps the most exciting sign of spring (for me, anyway) is the return of the thunderstorm. 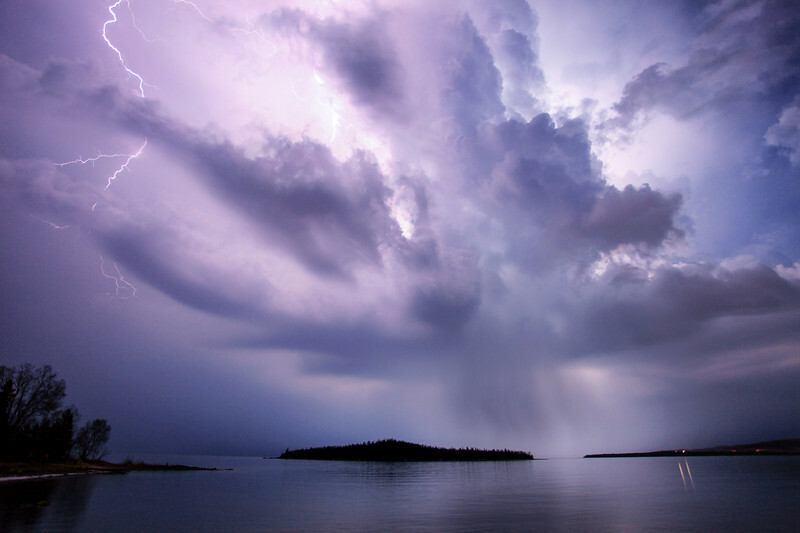 Last night we had a whopper of a thunderstorm make its way over Grand Portage Bay. This was a very localized storm, with brief but heavy rainfall and some medium-sized hail. Oh, and an awesome display of lightning! I was up late last night working on editing some photos when I started seeing flashes of light outside my living room window. At first I thought I was seeing things. I thought "That can't be lightning... it's only mid-March!" But, sure enough, as time passed I noticed more and more flashes and soon it was apparent that it was indeed lightning. I grabbed my camera gear and headed out to do some shooting. I went to a location just a half-mile from my house, one that afforded the best view of the approaching storm and one that would allow me to photograph the storm before any potential moisture fell. After photographing the lightning flashes for about 15 minutes, I noticed something that is not often discernible with an approaching thunderstorm in this area. I could HEAR the rain and hail approaching! Before the storm hit shore the conditions were incredibly calm, not a lick of wind and the lake was smooth as glass. But, out beyond the bay, the hard rain and hail was hammering the surface of the lake. What I heard was an ever-increasing sound, a haunting WHOOOOOOOOOOOOSH as the lake was pummeled by the rain and hail. Soon the sound was quite loud and when the lightning flashed I could see that at any moment the moisture was going to hit shore. A good time to get back in the truck, I thought! So, I packed up my camera and walked back to the truck. I had only taken a few steps when the rain started to fall. It was only about 100 feet back to the truck and by the time I got there it was pouring. By the time my gear was put away in the back seat and I was sitting in the driver's seat, the sound of hail was all I could hear as it pelted the sheet metal of my truck. I drove around to the other side of the bay to see if I could get a different angle on the storm, and it was barely raining just two miles away! Short but sweet, as they say. The rest of the night we had a crystal-clear sky exploding with stars. 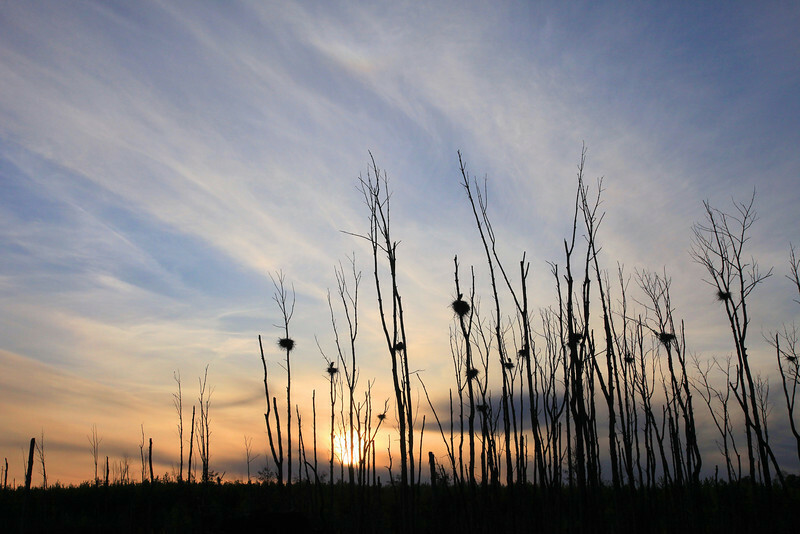 "Great Blue Heron with baby at sunset"
"Great Blue Heron rookery at sunset"
On May 17th, 2012 we went to visit a Great Blue Heron rookery with 17 active nests. 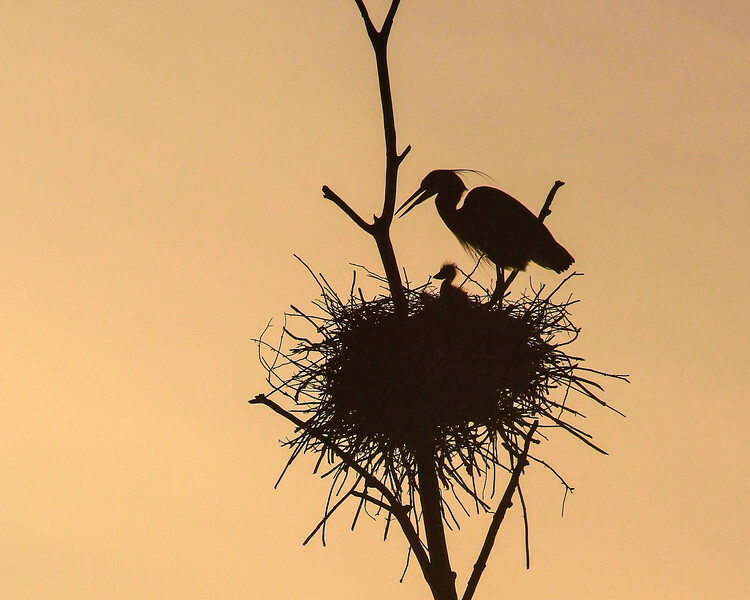 This was my first time seeing a heron rookery and I was fascinated by it. 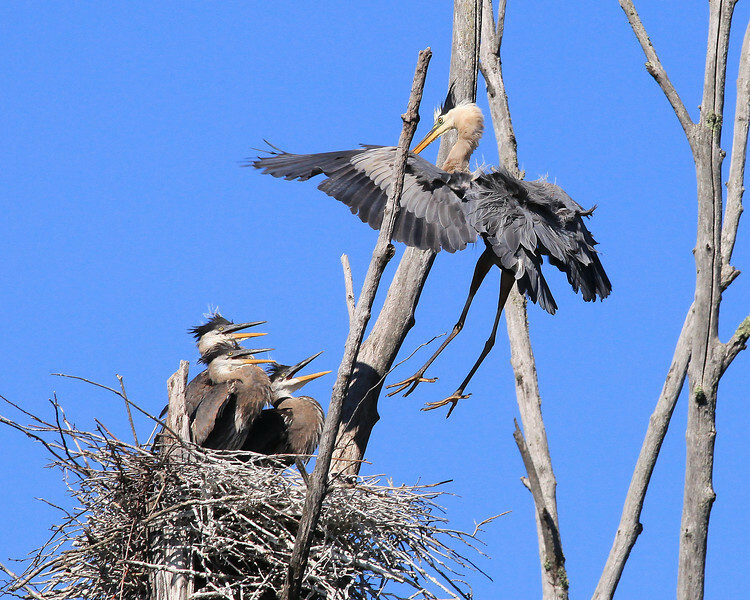 The birds were pretty active, with the adults changing places on the nests quite frequently. It wasn't until late in the evening when we finally noticed some babies in one of the nests. 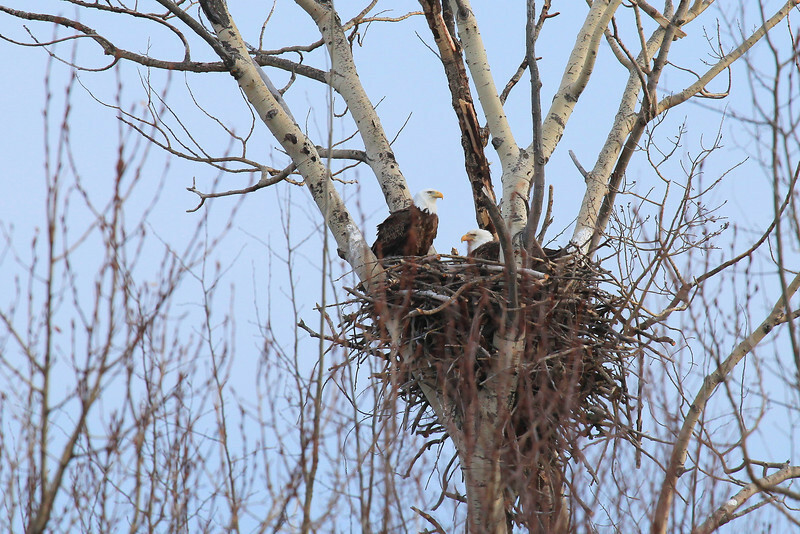 At one time we could see three individual baby heads sticking up out of one of the nests. It sure was a fun day watching these birds and I couldn’t wait to go back in a few weeks and see the babies again when they are hopefully a lot bigger. 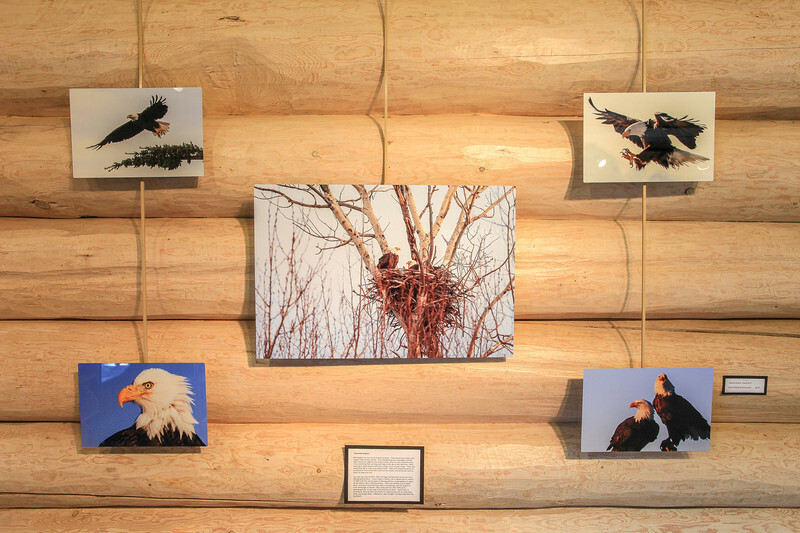 June 6th: We visited the rookery again and WOW how the babies have grown! On our last visit we saw just a few and only their heads stuck out above the nests. This time, they were a lot more visible because they were a LOT bigger! As far as I could tell, all but one or two of the nests had 3 babies in them. That means there were about 45 young herons in this rookery! 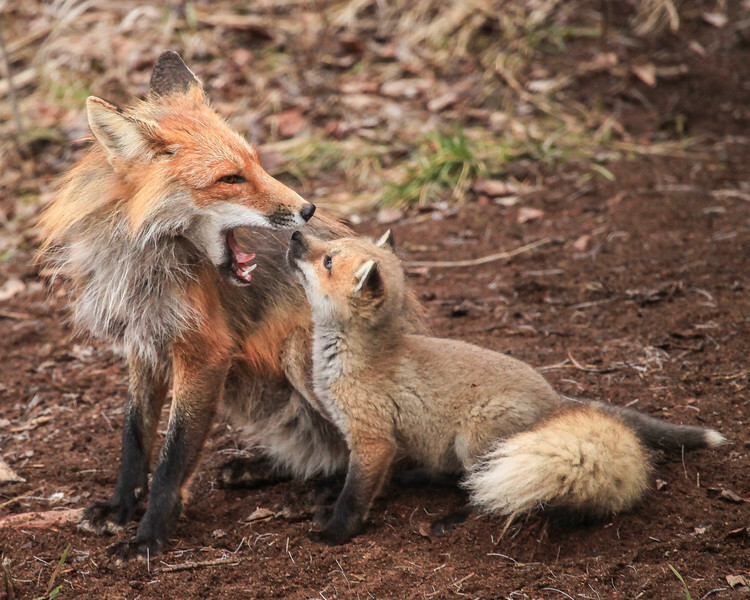 Over the years I have had the great pleasure of photographing several fox families. This collage represents some of my favorite moments during the countless hours that I’ve spent observing them. The locations in which I’ve seen and photographed the various families have ranged from within half a mile of my home to over 100 miles away. 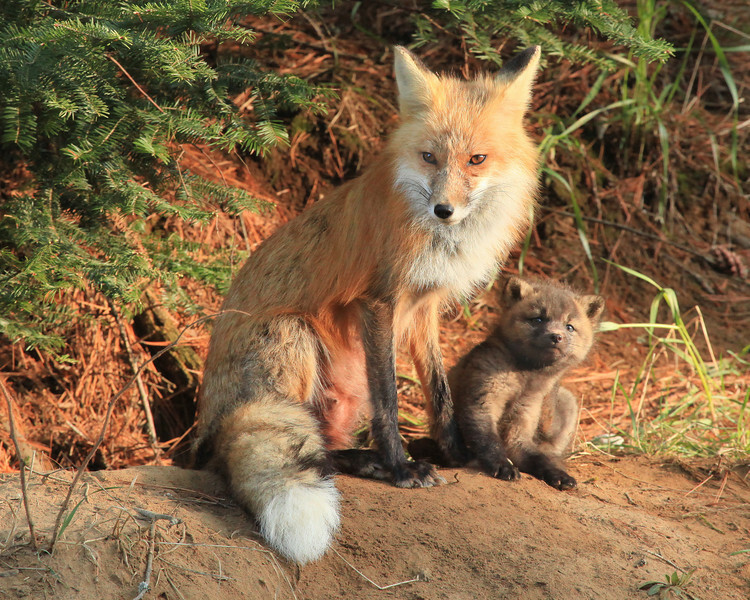 There were times when I was able to drive by a den and see them right away, other times I had to sit and wait 5 or 6 hours before they would come out. 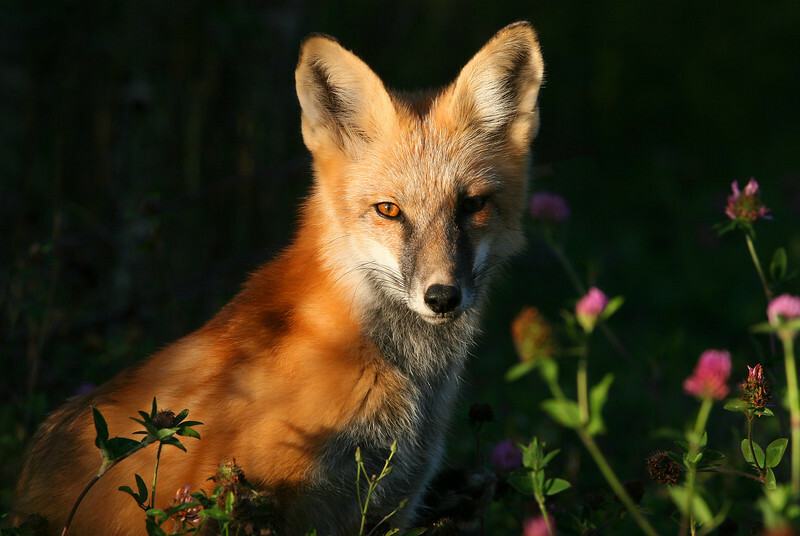 They are always very curious critters and definitely lots of fun to watch and photograph, especially the interactions between the kits and the adults. 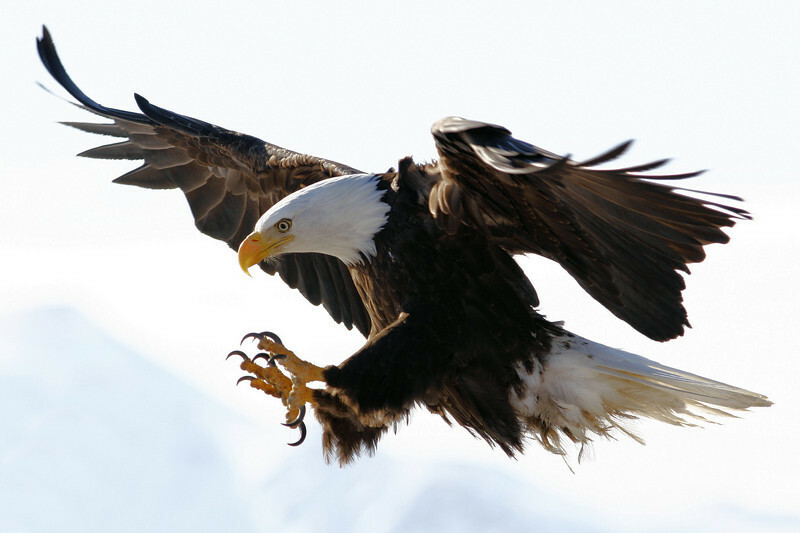 Bald Eagles are one of my favorite animals. They always have been and I suspect they always will be. 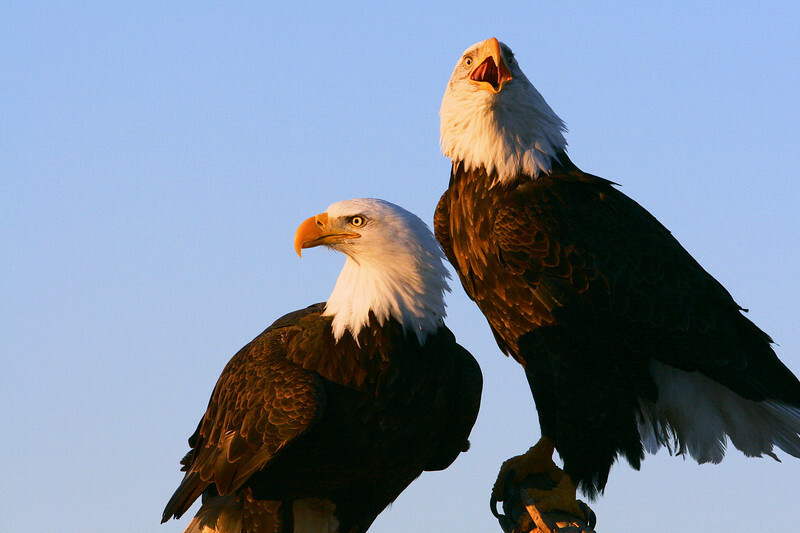 Even though they are scavengers and will take almost any opportunity to get a meal, they are also majestic birds. I love watching them as they soar high in the sky on the thermals, often seeming to glide forever with only a flap or two of their wings. They also sometimes seem to be very patient birds. They will frequently perch on a dead birch tree across the road from our house and sometimes will sit there for hours on end. Any way you look at them, they are huge and beautiful birds and I love photographing them. 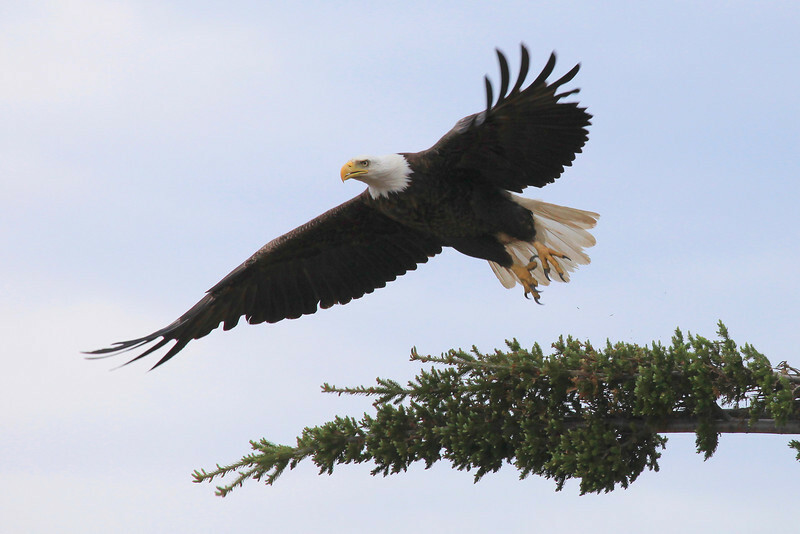 I even made a 10-day trip to Alaska back in March of 2007 with the sole purpose of photographing a congregation of eagles on the Homer Spit in Kachemak Bay. That trip yielded a lot of great shots, and apart from the long flight to Anchorage and the long drive from Anchorage to Homer, they really weren’t that difficult to photograph due to the large concentration of them. Back home in Minnesota, shots of them are harder to come by but just as rewarding when you do get them. 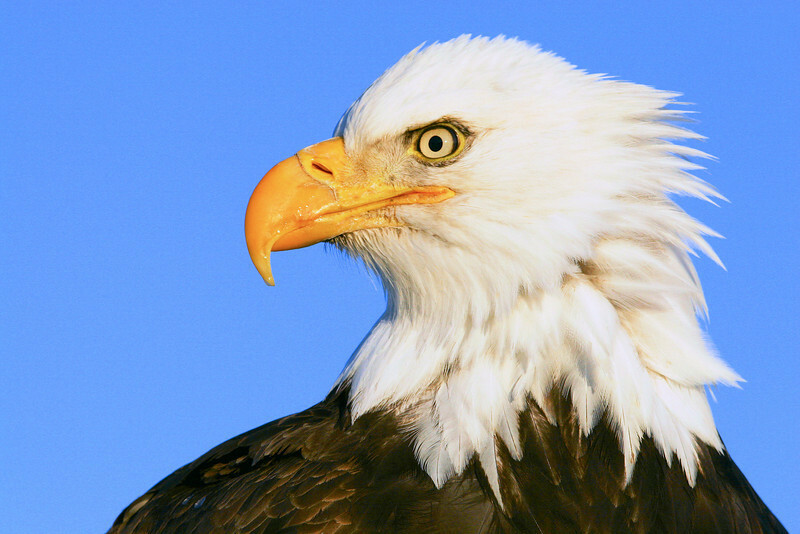 Whenever I see an eagle it brings happiness into my heart! "Eagles in the early morning light"
This photograph was made from the Pigeon River Helipad and Overlook on Otter Lake Forest Road in northeast Minnesota. Ever since this overlook was built, I've been stopping there whenever I'm in the area in the hopes of seeing a moose down along the river. Being quite familiar with the river from the seat of a kayak, I knew that this bend in the river was a common place to see them. However, I had never seen one from the overlook until today! 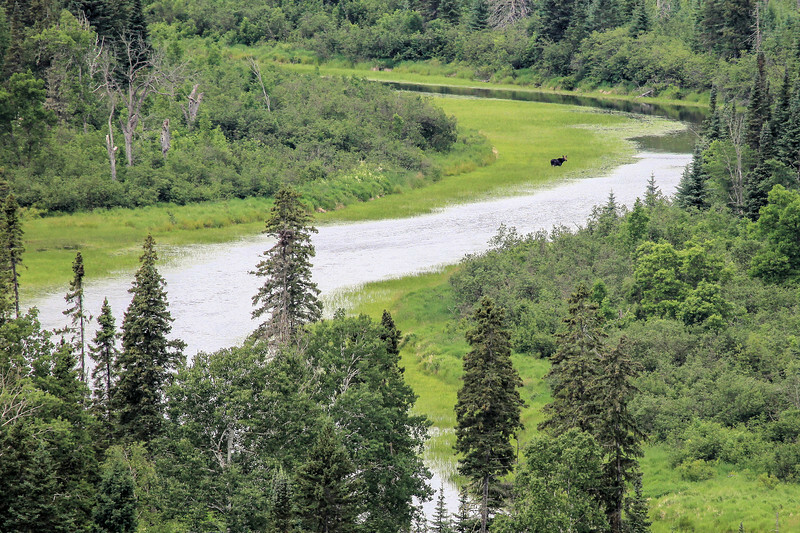 I watched through my telephoto lens as the moose moved throughout the shallows for several minutes. Eventually he turned and gave me a nice profile of his body. It was cool to finally see one from this vantage point! 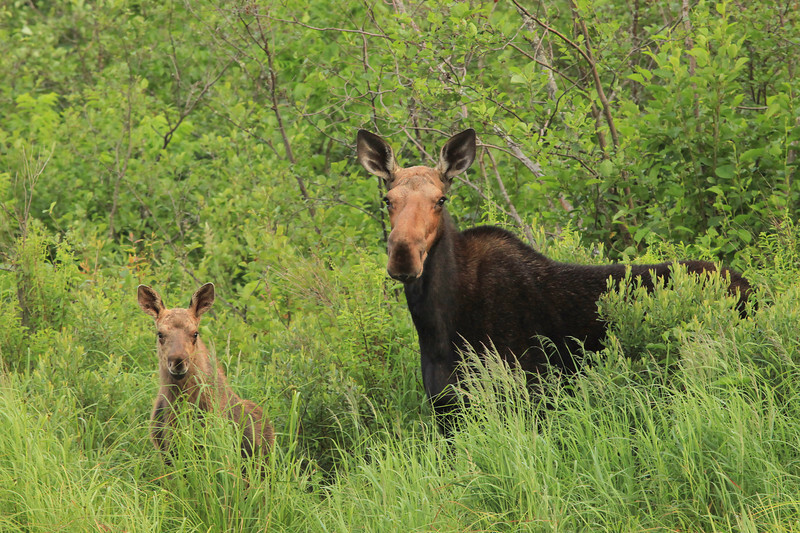 This marks my 18th moose sighting of this year! 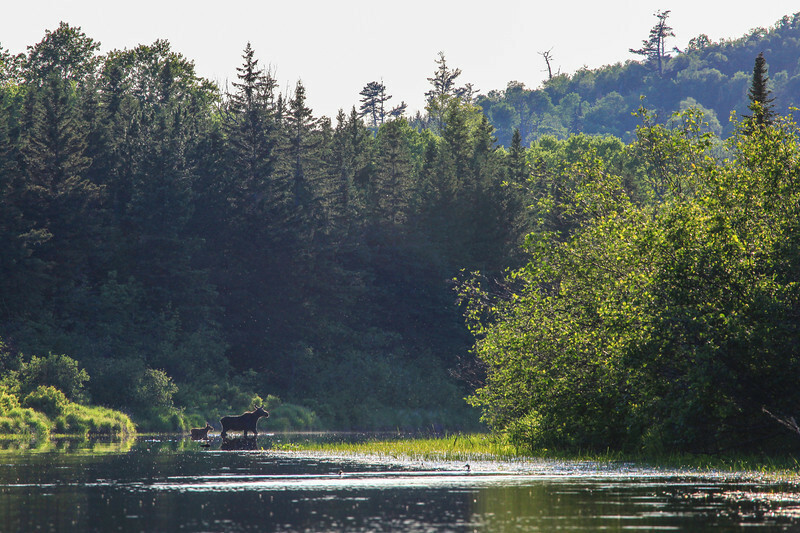 I spent almost 4 hours on the Pigeon River today, and it ended up being time well spent because part of the way through that time I ran into this moose cow and calf, which made for a great picture! After making this photo they ran off into the woods, so I continued down the river and about a mile later there they were again! I noticed them earlier the second time and tried sneaking up on them along the edge of the river. I was upwind, however, and before I could get close enough to get good shots they were gone into the woods. I'm grateful that I was able to get this nice shot of them, though! I love how they are both checking me out with their ears pointed towards me. "Moose mother and child crossing the Pigeon"
What a day! 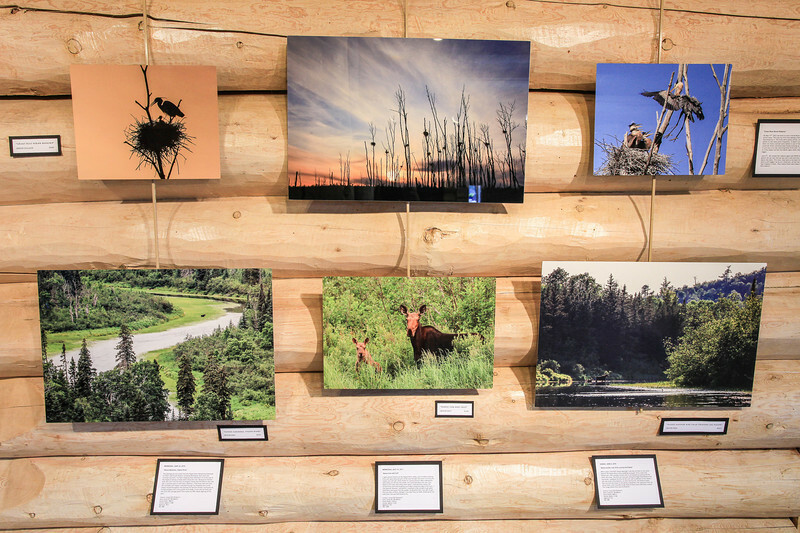 I had FIVE moose sightings! I saw four of them on the same bend of the Pigeon River while paddling my kayak. First a male and female pair, then another female with a calf showed up and scared the other two away. The fifth one was seen along Partridge Falls Road on the way home. 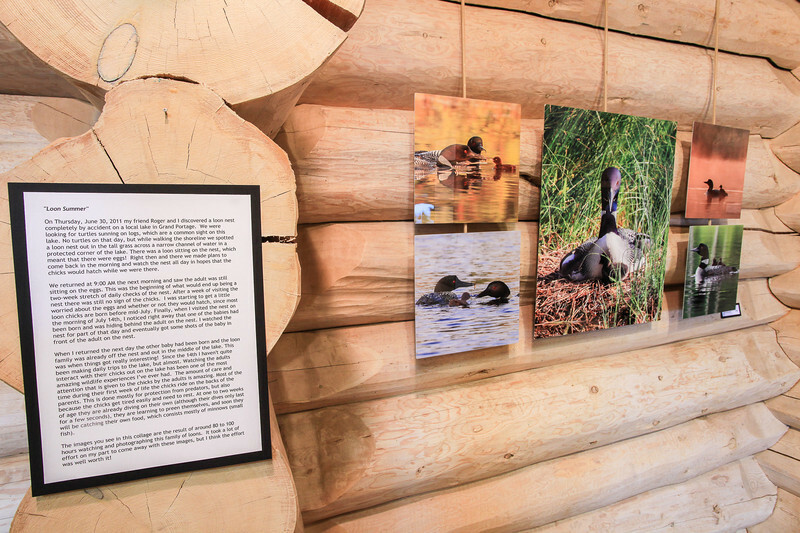 I paddled 10 miles on the river and in addition to the moose I also saw quite a few beavers, an otter family of 6, and several ducks. The cow and calf shown in this photo crossed the river upstream from me three times, and I was able to get shots of them each time they crossed. The image shown here was my favorite. "Star Trails over the Ghost Maple"
This tree is a maple tree that I like to call "The Ghost Maple", since (to me at least) the silhouette of the tree resembles a rather "ghostly" looking figure. 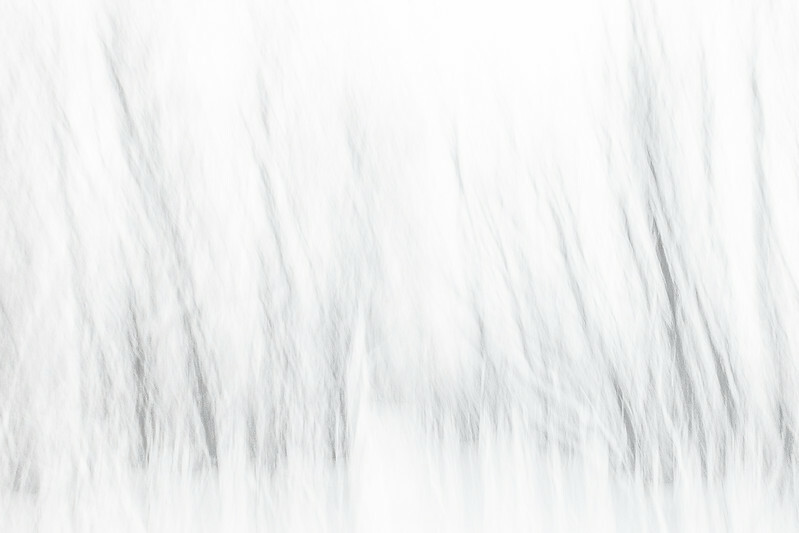 Each year after the leaves fall I like to make images of the "Ghost Maple". When the leaves are on the trees the profile of the tree just doesn't stick out the way it does after the leaves have fallen. This year, I wanted to get some shots of the stars behind the tree. My original desire was to get a star trail image. It would take 3 consecutive nights of shooting the tree to get the shot I wanted. 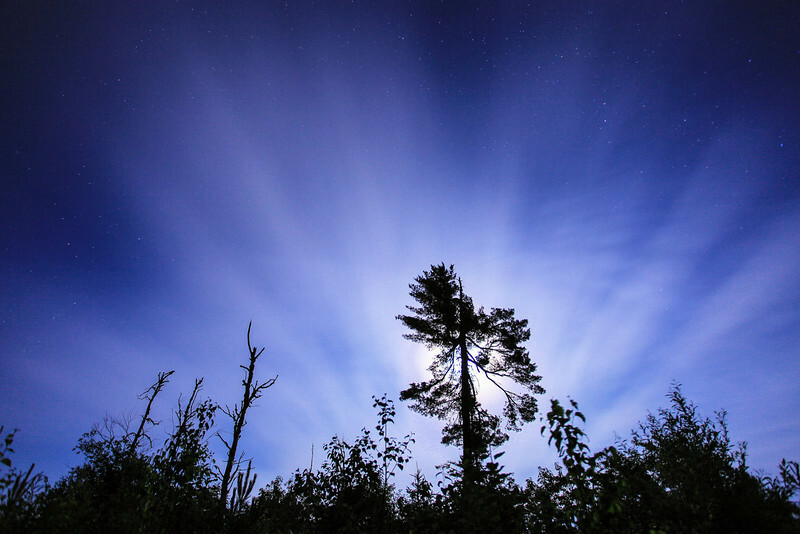 When I got to the tree on the first night, the clear skies that were prevalent over Lake Superior were nowhere to be seen deep in the woods and I had to deal with a very overcast sky. So, I took the opportunity to try and get a little creative with the lighting. I waited until the moon was up (of course, I couldn't SEE the moon because of the clouds, but there were some thinner areas of cloud where, on occasion, the moonlight would sort of come through) and I made some exposures with the tree illuminated from the brake lights on my car. On the second night, the sky looked a little more promising for some stars. Again when I got up to the tree the clouds had moved in, although they were much thinner than the previous night. Star trails weren't going to work on this night, either, as there were once again too many clouds. So, instead I shot a high ISO "short exposure" image of the stars and the hazy clouds as the moon was rising in the distance. On the third night I got what I wanted. Crystal-clear skies without a cloud in sight! I lined up my composition, dialed in my focus, and locked the shutter down for a one-hour exposure. I had great fun each night I was up there, and I guess the whole point of this is that even though you may not get what you are hoping for on the first try, don't get too discouraged because you may end up with some neat images that you weren't expecting! "Spinning Stars over the Spirit Tree"
Making images of star trails is one of the most interesting things you can do with a camera. It can also be one of the most difficult and frustrating. For one thing, you need a lot of patience to sit there for a half hour or more (in the dark!) while your camera records the exposure. You also need to be very diligent about making sure your camera has obtained good focus and, of course, you need a nice clear night. If there are any clouds at all (even very thin ones), your star trails will be broken up rather than nice clean lines. 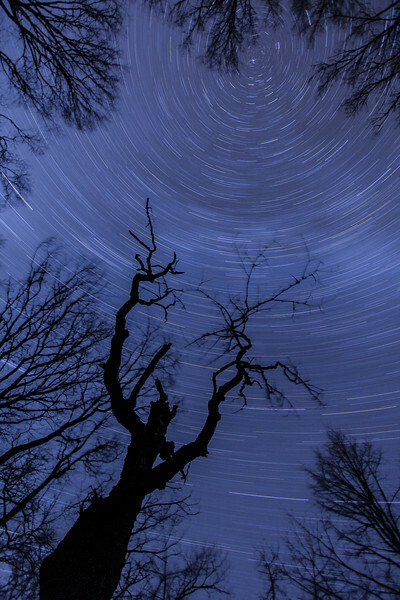 Getting good star trail images takes practice. My first efforts at this type of photography were utterly disappointing. Sometimes the camera was horribly out of focus, other times the final exposure ended up being either way too bright or way too dark. 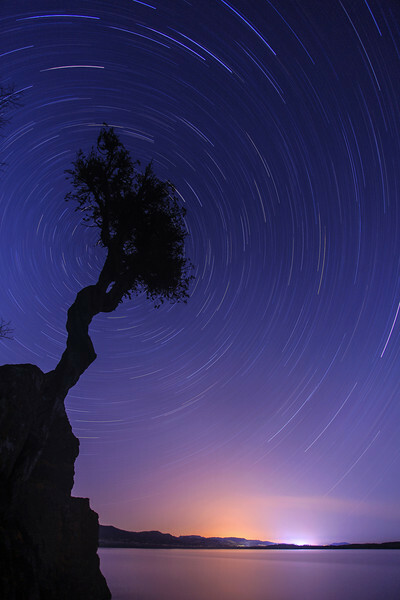 On this night when I decided to try a star trail shot over the Spirit Tree, everything came together. I had a nice calm night with zero clouds in the sky and I set everything perfectly on the camera. After my 1 hour and 16 minute exposure finished recording, I was very pleased to see this beautiful photo on the camera’s LCD screen! 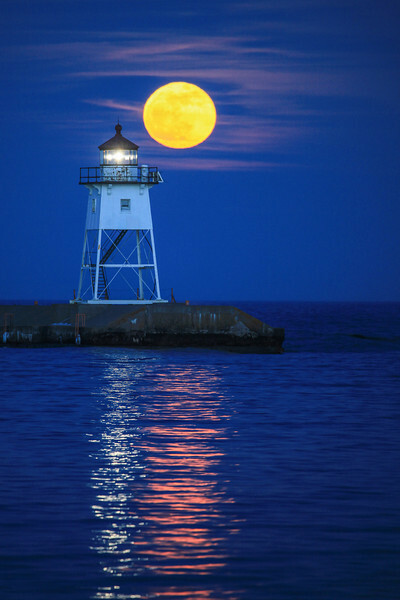 "April moonrise over the Grand Marais Lighthouse"
Last night after work we headed to Grand Marais to photograph the rising full moon behind the lighthouse. At first it looked as though we may not see the moon at all, because there was what appeared to be a cloud bank forming on the eastern horizon. As it turned out, though, we were able to see the moon completely and once it rose a little ways into the sky the thin clouds started to illuminate from the moonlight and really complemented the scene. I made plenty of photos as the moon passed behind the lighthouse, but this one where the moon is just above and to the right of the lighthouse is my favorite. I really liked how the reflection of the moonlight and the reflection of the lighthouse light are side by side on the water. What a magical sight!